The Amber Room of Peter the Great underscores the story of SHADOWBOX with subtlety and myth. Royal Amber, a fantastic material more occult and obscure than ordinary Baltic amber, with rare and significant qualities. Royal Amber is an invention, a fictitious treasure, but even ordinary amber takes a special place within the story of SHADOWBOX, and in the mythos of the Cuckoo Club beyond the pages of the novel. One such place where Royal Amber exerts its influence is within the Amber Room. The real-life Amber Room is a chamber of shadows: a symbol of wealth and power, a marvel of craft and a WW2 enigma all rolled into one artefact. Stories of its loss – looting, under the UN definition – at the end of the Second World War, and its possible rediscovery decades later (most recently in the collection of Cornelius Gurlitt, an elderly Austrian), only serve to heighten the mystique. Of course, the Amber Room is made of ordinary amber – six tons of the stuff. It’s a breathtaking accomplishment of craft and as dazzling a symbol of wealth as a Fabergé egg. In 1832, while my characters swan around Paris and London, the Amber Room exerts a strange attraction all the way from St Petersburg. 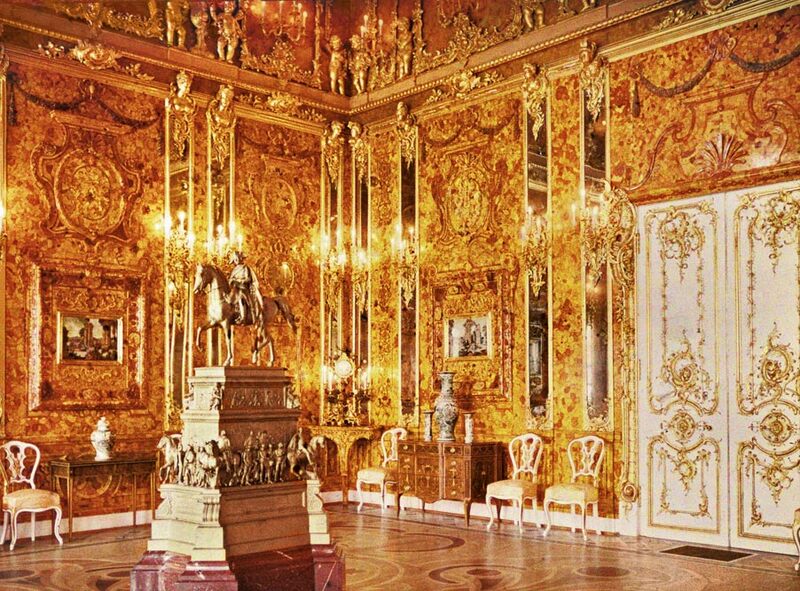 You can find much the same historical information all across the first few pages of Google if you want to look for more on the Amber Room. Wikipedia is a good place to start, and the St Petersburg page. The Amber Room, a dazzling construction of panels of the golden resin, backed with gold leaf and mirrors, was commissioned by Frederick I of Prussia. Presented as a gift to the Russian Tsar Peter the Great in 1716, the room – made up of 100,000 pieces of intricately carved amber of varying golden hues – was installed in the magnificent Catherine Palace near St Petersburg. A small chamber, the first suite of panels enclosed an area 11 feet by 11 feet. The amber panels were crafted by Gottfried Wolfram, master craftsman to the Danish Royal Court, with amber masters Ernst Schacht and Gottfried Turau from Gdańsk in modern-day Poland. Gottfried Wolfram enters SHADOWBOX as an ancestor of one of my main characters. His connection to the Amber Room – and to Royal Amber, my fictitious gem – powers part of the story. During World War II the chamber was looted by Germany and taken from Leningrad to Königsberg on the Baltic coast of modern-day Poland. Knowledge of its whereabouts was lost in the chaos at the end of the war. Interestingly, Königsberg was the place from where the Teutonic Knights launched the Baltic Crusades in 1242. Not short of historical resonance, these places. In 1979 efforts began to rebuild the Amber Room at Tsarskoye Selo, its first home in Russia. In 2003, after decades of work by Russian craftsmen, the reconstructed chamber was inaugurated in the Catherine Palace in Saint Petersburg. And in SHADOWBOX the Amber Room tugs at the edges of the story with a magnetism borne of myth. Next post in the SHADOWBOX series: Luxury, nearly 200 years ago. Join me on the trip by subscribing to the RSS feed or sign up in the form on the right to receive posts by email. Bring your best walking-cane. The story of Shostakovich in Leningrad must be one of the best examples of art enhancing life in the face of overwhelming odds. IIRC it was Vladimir Ashkenazy who, when asked why he stayed in the Soviet Union despite being able to leave, replied that he wouldn’t have the chance to play with the same calibre of musicians outside. Running the proofs through CreateSpace at the moment I have that extraordinary feeling of “I just made a novel!” I’ll load up links when the final version’s approved, and all the usual ebook channels too.